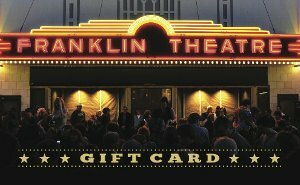 Give someone you love an experience they won't forget - Give a Franklin Theatre Gift Card. Gift cards are good for any event for which tickets are available and on sale to the public. Concessions items and Franklin Theatre merchandise may also be purchased with a gift card. And… they never expire! Click below to process online and your gift card will be mailed. Gift cards may also be purchased at the box office or over the phone at 615-538-2076.